Rob Cesternino and Akiva Wienerkur were looser than cream corn, ready to recap the next episode in their run through the entire Seinfeld series. 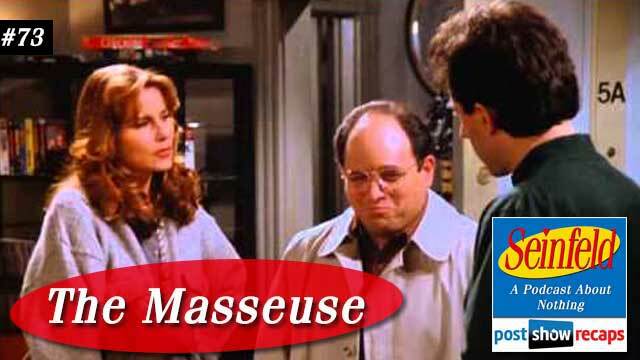 This week, they cover “The Masseuse” which first aired November 18, 1993 as part of season five, and was written by friend of the podcast Peter Mehlman. It was a slow news week, but Akiva still delivered a few Seinfeld related tweets to make due. Amir Bloominfeld from College Humor wondered how Seinfeld got such good ratings if Jerry wasn’t tweeting about it. Chris Regan asked if the Pope has taken the real Kramer Seinfeld tour yet. Rob noted that Jerry Seinfeld was a guest on the Mets broadcast last week talking about the upcoming playoff excitement. No Scene It question this week, so Akiva remains at 8-6. Jerry’s opening standup is a bit about serial killers always being known as quiet. The episode opens with Jerry on the phone with Elaine talking about Jerry’s impressive throw up streak, and how her current boyfriend has not thrown up for years himself. He also happens to share the same name as a famous serial killer, Joel Rifkin. Elaine faces some ribbing from her coworkers about this after hanging up with Jerry. In the next scene, Elaine and Jerry are taking about how she wishes Joel would change his name. Kramer comes in and answers how many people the serial killer Joel Rifkin killed, then pops back in when Elaine offers an extra ticket to the Giants game. Jerry mentions how George is back together with Karen, who he is going on a double date with, since George thinks he shines in this setting. He mentions his girlfriend Jodi (Jennifer Coolidge, Stiffler’s mom) is a masseuse, but hasn’t given him a massage yet. On the double date, George is telling a funny story, but Jodi is not into it, looking annoyed by George. Meanwhile, Jerry keeps dropping hints about how badly he needs a massage. After dinner, Jodi remarks how much she doesn’t like George while Jerry still keeps trying to get a massage. Back at the restaurant, George is obsessed about whether Jodi liked him or not. Karen gets frustrated by this, as he’s giving her no attention. Elaine and Joel are at Elaine’s, and she is startled when he puts her hands on her neck for a massage. She starts talking about different names from this football program she’s reading, trying to get Joel interested in changing his name, even suggesting OJ. Rob and Akiva talked about how ironic it was to suggest OJ to not have the name of a killer. At the diner, George and Jerry are talking about their double date from last night. Jerry is still complaining about not getting a massage, while George is prying to find out if Jodi liked him or not. Jerry confirms she did not like him, to which George can’t believe it. Jerry comes back home and runs into Jodi in the hallway, having just given Kramer a massage. Rob and Akiva felt this is another Kramer violation of the “bro code”. George comes up and continues to try to get back in Jodi’s good graces by carrying her massage table down to the cab, even helping her hail one. Back up in Jerry’s apartment, Kramer keeps going on about the massage, and Jerry bans him from it, since he hasn’t had one himself. At Giants stadium, Joel shows Elaine a picture of his mom, and mentions he’s adopted. Elaine is spooked by this, since Kramer had pointed out that a lot of serial killers are adopted. Kramer is at the will call window but doesn’t have an ID, so they call for Joel Rifkin over the loudspeaker, causing everyone in the stadium to look alarmed. Kramer comes in to Jerry’s, complaining about his back from the seats at the Giants game. He tries to convince Jerry to let him have a massage to no avail. Meanwhile George and Karen are at the diner, where George is going on about Jodi not liking him, with Karen wanting him to just drop it. Elaine and Joel are discussing the name change, even reading off a list of choices. Neither like the other’s choices, leading to them fiercely arguing with each other. Back at Jerry’s, he breaks out her massage table to try and force a massage, but she’s not liking it. Rob and Akiva thought this scene was a bit too aggressive. George and Karen are in the middle of kissing when George stops to talk about Jodi not liking him. Karen has had enough, but George can’t let it go. When Karen says she now hates him, George was okay with it, that he’s used to it. Jodi is frantically packing up her table while Jerry criticizes her for being a massage tease. George bursts in, wanting to talk to Jodi because her hating him so much has made her irresistible to him, and he runs after her when she leaves. The episode ends with another standup bit about massages. In 2015, Kramer wouldn’t have such a hard time getting by will call, and Jodi would have an app for her massage business. Akiva said while he laughed a lot in this episode, there were too many confusing scenes, so he ranked it at 123, to which Rob was on board with. Craig emailed in to say how he didn’t recognize Jennifer Coolidge as Stiffler’s mom, and also congratulated them on the Mets making the playoffs. Garrett wanted to note that this episode was the most dated because of the lack of cell phones, and Elaine’s comment about OJ being a good name. He also wanted to know what other celebrity name mention would be as creepy. Rob recommends Osama as an option, or maybe Bill Cosby Rifkin. Johnny De Silveira wanted to know what name they’d choose if they were in the witness protection. Akiva chose LaDamlian, while Rob wanted something easy to spell, like Todd Jones. Amir emailed in asking why Kramer was so worked up about Jodi’s massages when there should be so many options in the city. He also thought George was ahead of the game about good looking women not getting tickets. Finally Adrian from Ireland presumed Jerry took several swipes on Newman’s head with the clippers, forcing Newman to clean it up. He also said he enjoyed Kramer’s falling off the stage in the episode. Tune in next week as the guys will recap “The Cigar Store Indian”. 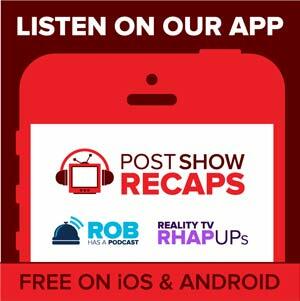 Send in your questions by emailing [email protected]postshowrecaps.com. Don’t forget to subscribe to the podcast by going to postshowrecaps.com/ seinfeldITunes where you can rate and review the podcast. You can get a discussion going about the podcast by leaving a comment on the show page, and as always, you can follow them on Twitter @robcesternino and @keev26.